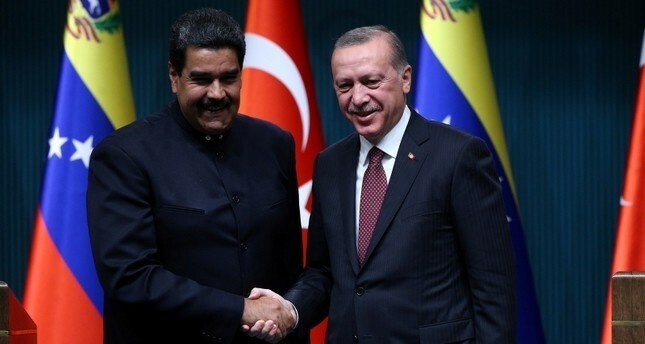 President Recep Tayyip Erdoğan said late Thursday that he is mulling a visit to Venezuela after the upcoming G20 summit, and that, "Turkey will not leave Maduro alone." Speaking to journalists after his New York visit, the president said that the South American country could be next in line. "Yes, it is a possibility," he replied to a question whether he was planning a trip to the country. "If the president's program is suitable, we can pay an official visit," he said about meeting with Venezuelan counterpart Nicolas Maduro. Maduro and Erdoğan have deepened economic and political ties, especially as the U.S. has imposed sanctions on both countries.